I promise they’re not so bad. When they’re fresh and properly fried, they taste like a crunchy piece of shrimp. They’re good for you too, so it’s a win-win. Fried crickets, that is. 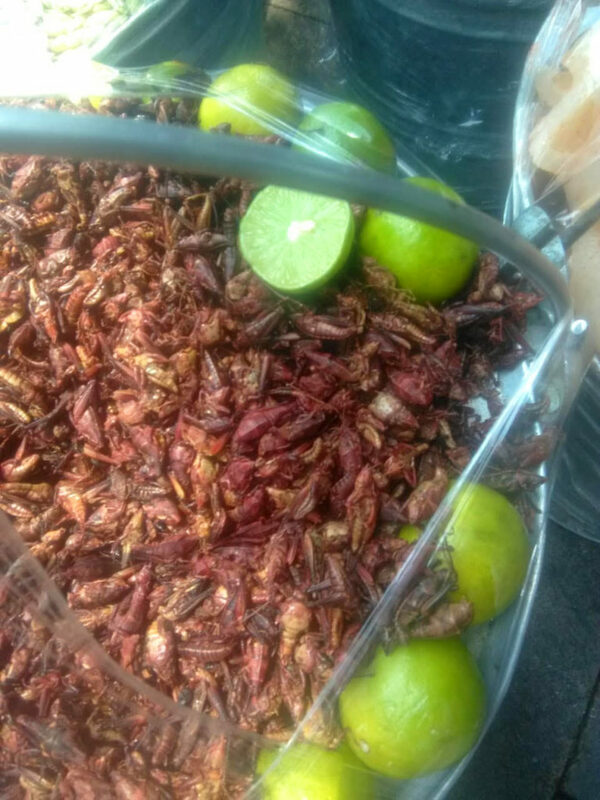 Growing up visiting Mexico, fried crickets was one of those foods you’ve tried at least once. I was pretty young the first time I tried a fried cricket. I remember my brother was still drinking out of sippy cups, and we’re only three years apart. That day, my aunt arrived at our house for a visit. It was the weekend so the market was open just a block down the street. She came in with a small plastic bag of what looked like lumpy dirt and set it on the dinner table. I remember thinking my abuelita was going to go bonkers if her tablecloth got dirty. It was lunch time, so my mom and abuelita were warming up the food. My aunt talked with us for a bit, let us know that the rest of the family would be there soon, and asked if we wanted to try some of the snack she brought from the market. Being the curious but stubborn child that I was, I asked what she’d brought, but she wouldn’t tell me. She said if I wanted to know, I’d have to try it. My brother was much more adventurous and just said yes without questioning it. She told him to close his eyes, and reached into the bag of dirt for a clump. That’s when I declined. But my brother’s crunching made me so curious. His eyes popped open and he said it tasted like chicken skin. I was obnoxiously stubborn, and adamant that my aunt tell me what it was before I let it anywhere near my mouth. She said it wouldn’t be as yummy if I knew what it was. Meanwhile my brother was stuffing handfuls of the dirt clumps in his mouth, reassuring me it tasted good. Of course, this was the kid who had actually eaten dirt on a dare at one point, so I wasn’t confident in his assessment. My curiosity finally won out, and I tried a piece of the mystery snack. It was a crispy bite, with a light flavor I couldn’t quite place. The texture reminded me of a fried chicken skin, as my brother had suggested, but the flavor was light in comparison. Entomophagy, or the practice of eating insects, has been around for centuries. Humans evolved as hunter gatherers, and insects are a good source of protein that was more available than bigger game. In comparison to meat, insects can be much more nutritious. According to Men’s Health, crickets have more than twice the protein than beef per serving. The protein crickets provide is much healthier than beef because it comes with essential amino acids as well. It’s completely embedded in Latin American and Asian culture, and others around the world. 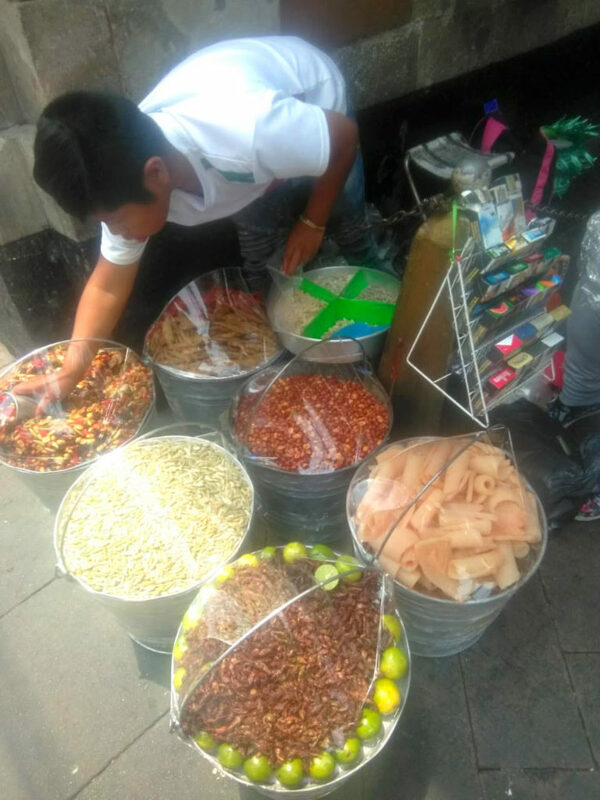 Fried crickets and grasshoppers are especially famous in Mexico. Many traditional markets in China have fried cockroaches as their best sellers. Eating bugs isn’t as prevalent in the US or Europe, because it was never integrated into the cultures, so it’s considered foreign and gross. Aboriginals in Australia are famous for their preparation of moths. Getting a good fried cricket is quite easy — if you’re in the right place. Most Mexican markets sell ready-made made, either sauteed, pan fried or deep fried. Some may also sell dried crickets, which are the kind with the highest protein content. In the United States, fried crickets can be found online. If you want to prepare live crickets, you’ll have to refrigerate them first, to slow them down and make sure they stay still. But, dried crickets are by far the best choice. Live crickets only have about a 21% protein content, while dried crickets have about a 50% protein content, so generally people use dried crickets; with an added benefit that they don’t move around as much. Pan frying crickets is one of the easier ways to make them. Heat 2 tablespoons of the oil of your choice in a pan. Once the oil is hot, add ¼ cup of dried crickets to the pan, then fry until they’re brown and crispy. Drain them on a paper towel to soak up the excess oil. Season to taste (adding some sprinkled chili flakes are my family’s favorite! ), and enjoy! There are also other delicious recipes for crickets, like a lime and chile cricket snack or 5 ways to cook a cricket.